6 - 9 pm at the studio. Download the information packet for more details. Online registration accepted through 11:59 pm 8/26/16. After that time, please print the forms below and bring them to auditions. For 15 years, the Austin City Ballet, a non-profit 501(C)(3) tax exempt dance company, has delighted the community with performances ‘by children, for children,’ including our annual presentation of The Austin Children’s Nutcracker. Our full scale professional production of the Nutcracker serves more than 1,500 patrons each year and is partially funded by The Cultural Arts Division of the City of Austin Economic Development Department. We are grateful for this award as it allows us to benefit from the generosity of the community and helps defrays production costs. This is not a recital, but rather a total professional performing opportunity. The Austin Children’s Nutcracker will run December 9-11 and December 16-18, 2016 at the Dougherty Arts Center Theater, 1110 Barton Springs Road, Austin, TX 78704. Auditions will be held August 27, 2016 at the TruDance Project studio, 10401 Anderson Mill Road, Suite 113, Austin, 78750. 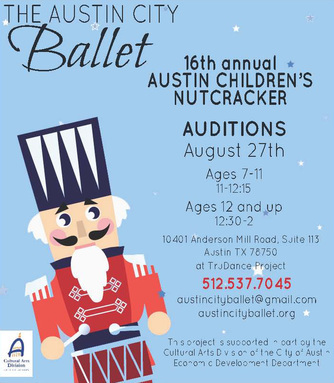 Performing in the Austin Children’s Nutcracker is an exciting and rewarding experience - a unique opportunity that you and your child will never forget! Please download and review the information packet above for help deciding if the Austin Children’s Nutcracker is right for your family.